Presenting in English is all about practice faking it, acting it and becoming it. And presenting in English with confidence comes from guided practice and good feedback. 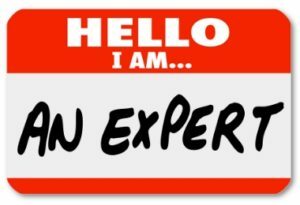 People become experts in their jobs and fields over time, but often lack expertise in communication and presenting in English. And that’s normal as they don’t spend as much time practicing communication as they spend becoming an expert. Presenting in English – How to get out of group 2? Why are there so many experts in group 2? The reason is because they spend a lot of their time becoming experts in their field, but not enough time practising communication and practising presenting in English. How can we do this? Try these three steps and practice them speaking in front of a webcam while recording it. The first step is that you need to practice ‘faking it’. You need to imagine and visualise that you are a great communicator. Try to think about what makes some people great communicators in your own language and then in English. For example, watch the most popular TED Talk Speakers and see what they do. This is what people in group 3 are excellent at doing. *Now practice this speaking in front of your webcam (2-3 mins) while recording it. Remember you need to ignore your inner voice that says “you can’t do it” and change it to “you can do it”. Record yourself three times. The second step is you need to practice ‘acting it’. You need to think like an actor and practice using some ‘theatre techniques’ such as use voice techniques (e.g. volume, speed, pauses, emphasis, etc.) and body language (hand gestures and body movement for dramatic effect). Observe how TED Talk Speakers use ‘acting/theatre techniques’ to communicate for dramatic effect. Then choose which ones you can do and feel comfortable with. “An actor is an expert in being someone else, while a speaker/presenter is an expert in being themselves”, Olivia Schofield. This quote summarises the key of step 3. Once you’ve practiced steps 1 and 2 you need to spend time finding your own voice and communication style. Ask yourself, “what´s my communication style?” and “what communication style would I like to have?”. Now ask a friend or colleague for feedback on your best recording. And email it me at info@englishtco.com for my feedback. I hope this helps you in your job and your professional career, Christopher! The English Training Company – Feel equal. Speak, meet and present in English with confidence!